Hi guys, welcome to this video. 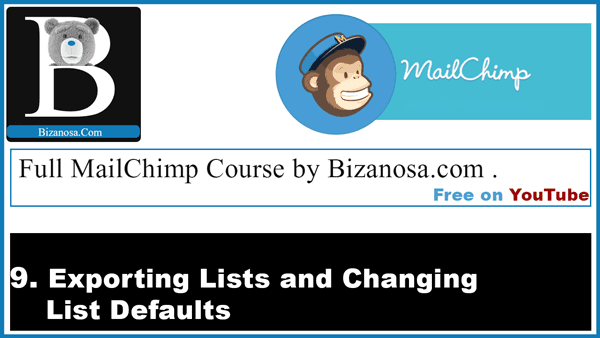 In this tutorial we will see how we can change some of the defaults and also how to export the list. To change the defaults, like if you want to change the name, and you want to change other aspects of this list, you go to “List Names and Defaults” . Here, you can change the name of the list. Then there are campaign defaults. ‘Default from name’ if you want to change the name : This is what the subscribers will see, this was sent by so and so. So ‘Default from email’ if you want to change the email you can change it here. If you have a default subject that you want to be used you can input that there. We had brushed on this a bit. ‘One by one’ ,so ‘email subscribe notifications to’ ,so input the email here. If you want the email to go…you want to receive each and every email for people that subscribe, this is where you do it. And you can even see MailChimp is not recommending this if you have a large list. Then, it’s the same for unsubscribe .You can put it here. If you want it to be sent to other emails you can put two emails here separated by a comma. Then you will save to keep the changes. So that is exporting subscribers, if you want to export a list of people who have unsubscribed, because that one is also here. You can see here we have “Subscribed”so you can come and click on unsubscribed .If I had people who have unsubscribed they’d be listed here but I don’t have anyone who has unsubscribed from this list because it is a new list I’ve just created .So if you wanted to export the unsubscribed list you would do it in the same manner here. Click on export List and it will be emailed to you. Okay guys, that does it for this video. In the next video we’ll finish up with lists by creating segments. Segments are, basically if you want to send to a particular segment in the list. If your list has different people, has doctors, has teachers and other professions . So let’s say you only want to send it to doctors , that’s where segmentation comes in. So we’ll take a look at that in the next video. And if you haven’t watched the other videos, just go to the playlist .I have created a playlist with all these videos so you will find them, you will find them there and go ,one after the other , watch the videos and you will become very good at this. Okay guys, subscribe and share the videos and embed the videos wherever you feel you need to embed a video .